After 70 long miles, we rounded the final corner into the tiny town of Silver Lake, wrapping up our first day of riding on Cycle Oregon, and I nearly burst into tears. 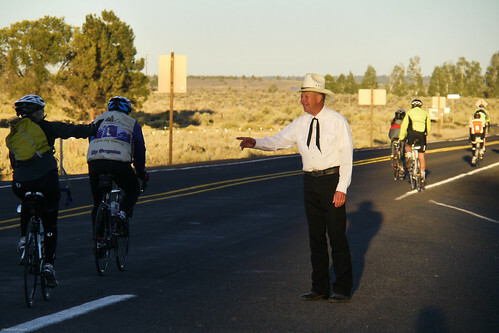 Cycle Oregon riders, volunteers, and staff outnumbered residents by twelve-to-one – but it didn’t stop the town from embracing us all. The high school cheerleaders were jumping up and down and cheering for us on the corner, the local pastor was standing in the hot sun to high-five riders and welcome us to town, and a street full of residents and volunteers clapped and cheered and handed out chocolate milk. In that moment, and countless times throughout the rest of the week, I was humbled and amazed by the kindness and generosity of community members, and reminded that people are simply incredible. 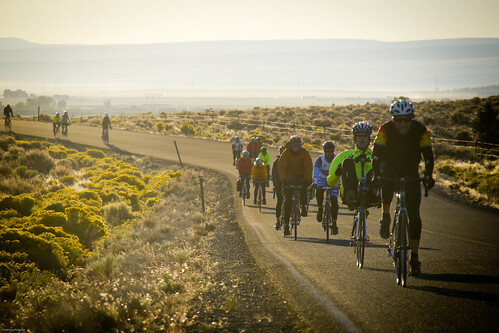 We joined Cycle Oregon this year, the 25th anniversary, to capture the experience on film. What does it mean to the small communities that host Cycle Oregon? Why do people give up a week’s vacation to volunteer for the event? What is the magic of this ride that is so very much more than just a bike ride? For me, it could all be summed up in that one moment of riding into Silver Lake, and feeling the energy and optimism. Or in talking to volunteers in Fort Klamath, who told us that funds raised from Cycle Oregon will allow them to insulate their small church (built circa 1920), which they currently have to start heating on Saturday in order for it to be warm enough for Sunday services during the winter. 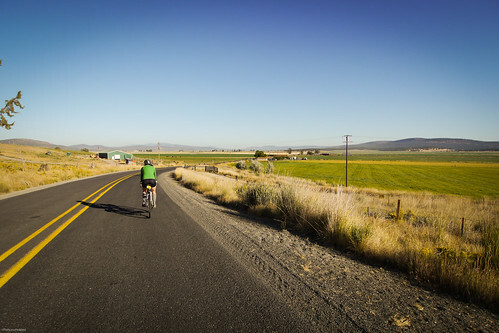 Ever since we learned about Cycle Oregon, we have been impressed by the rural economic development component of its mission to transform individuals and communities through cycling. 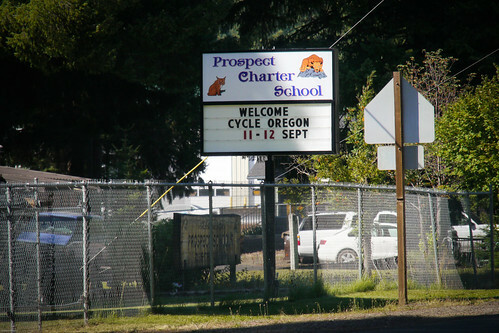 But simply hearing, third-hand, about the impact on small-town Oregon does not do it justice. The experience of being a part of the impact is overwhelming and breath-taking. 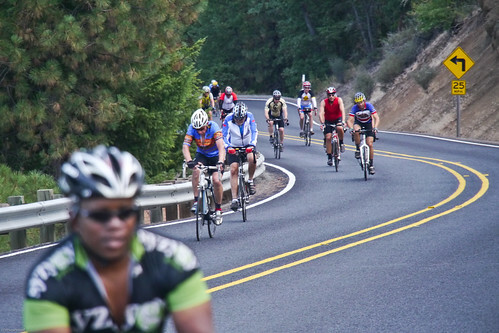 Without a doubt, Cycle Oregon was one of the most physically-demanding trips. In six days, we rode 400 miles and climbed roughly 25,000 feet of elevation. We camped out each night and woke up at 5am each morning (enduring two mornings of sub-freezing temperatures). We checked the Crater Lake rim road off our bucket lists, tested out the new disc brakes on the steep and fast descents, and were told by some roadies that we were putting them to shame by riding so fast on our fat tires. And, throughout it all, we lugged camera gear and shot over 15 hours of footage, including interviews with community members, volunteers, riders, board members, and vendors. Long-time readers know that large event rides are not usually our cup of tea; but Cycle Oregon isn’t just a ride, it’s an ambassador for cycling and a community builder and a benevolent economic force. In town after town, we heard about how mindsets were shifting, residents were coming together, civic groups were raising money to improve their communities, kids were learning about the wider world – and we heard from riders who traveled from far-away states and countries, because they knew that their rider fee would be used to build something long-lasting and worthwhile. Over the next many weeks, we’ll be re-visiting all of the footage we shot and compiling a short film about the Cycle Oregon experience. We can’t wait to share it, because it’s a story we can’t wait for everyone to know. Hey! Great blog! Love how you have captured the essence of Cycle Oregon, It was my first time too. I noticed you two around, mostly because as a fan of photography, I noticed you using the GH2 to document the event. I didn’t really connect the dots and I was probably a bit exhausted from the day to stop by and say hello! My apologies…. Looking forward to your video edit! At Cycle Oregon the rest of the world melts away and all that is left is cycling with our Cycle Oregon family. All we think about is getting from one wonderful town to another and the journey between. Wonderful people, wonderful food, wonderful staff, wonderful towns. For JV and I it is the best vacation ever. On Saturday when it is over and the real world comes back into focus there is a feeling of wholeness and peace that comes back with us from our week of the good life. We can hardly wait till February. Thank you C.O. family for a great time! I eagerly await your visual perspective on the 25th Cycle Oregon. I’ve had a dream to ride this tour in 2013 and have spent this year training to ‘get ready’ for next year. What CO accomplishes in advocacy for communities and cycling is simply amazing! Cycle Oregon has long been on my bike bucket list and your commentary and photos only move it higher up the list 😉 looking forward to your film of the event. 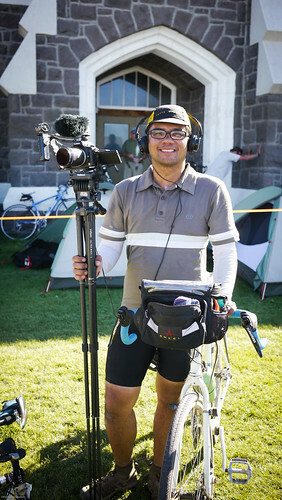 Cycle Oregon has long been on my bike bucket list and your commentary and photos only move it higher up the list, looking forward to your film of the event.